Rakusan did not include the Fan Series in his main sequence numbering. Therefore, the original number used for each of the 36 Series prints has been modified to identify the Fan Series members of its theme. The five different fan silhouette shapes have been here assigned arbitrary numbers 1 through 5. To indicate a fan design these shape designations are added to the 36 Series number separated by a hyphen. 109-4 is the Fan Series design with fan shape 4 in the 109 Eggplant theme. Like all other designs in this series, 109-4 was only produced in a single print run, and few copies are currently documented. The composition of 109-4 shows a portion of an eggplant with leaves, an open flower, and a few buds but no fruits. Flying from the plant is a long-headed locust. All of the elements are rendered in a loose flowing style with bold lines and solid highlights which works equally well either as ishizuri or in the original sketch. The large insect is clearly a member of the grasshopper family Acrididae. It is probably the Oriental Long-headed Locust, Acrida cinerea, 精霊飛蝗, しょうりょうばった, ショウリョウバッタ, shouryou-batta, lit. 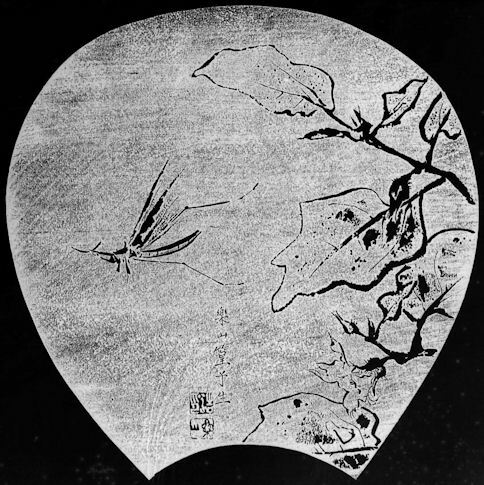 'spirit-locust', a common Japanese species. 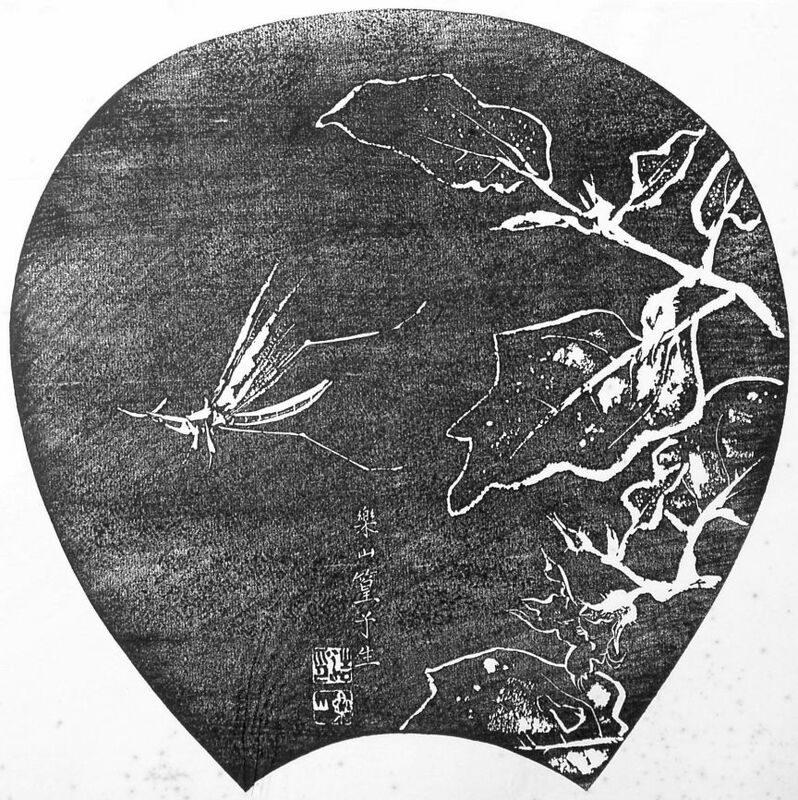 Rakusan has used the same sort of insect in several different designs.